Last week we stayed a few nights in a cottage in Child Okeford. It's not a village I'd heard of before and in case you haven't either it's about fifteen minutes from Blandford Forum, if that helps! The village has a couple of pubs, a shop and a post office and paths leading up to Hambledon Hill, which is a prehistoric hill fort that looks over the village. We had a blowy walk up there one morning, but that's a whole other post. So let's start with the cottage's garden; it was a small but perfectly functional garden with a path up to the door, stepping stones over to the wood store, a rockery and a small area for the barbecue, which we didn't get to use. Along with the succulents, the real star of this garden for me was the dusky pink hellebores. Delightful! And you can't go wrong with such a characterful gate post either. There were plenty of bulbs on the way and I imagine in a month or so there'll be a lot more colour in the garden. We made do with the pot of succulents and those shy hellebores. 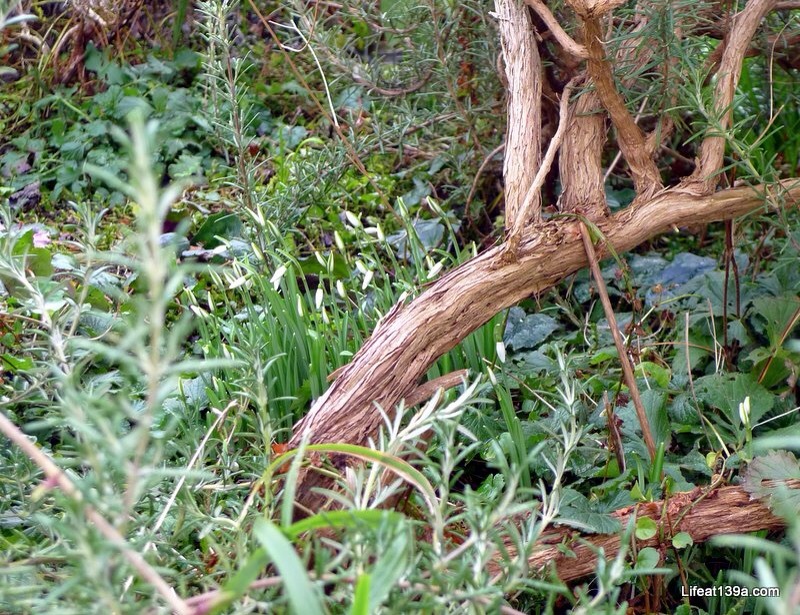 There were also the beginnings of some snowdrops under the gnarly Rosemary bush and growing along the fence it looks like there's a Passion flower. Child Okeford is a relatively busy village traffic-wise but it's charming nonetheless and it has a lovely village sign too. We walked through the village before and after our trip up the hill so I'm sharing some of that with you today too. There's cyclamen growing throughout the graveyard and I spent some time admiring the hedges too, and smiling at the name of this house, it refers to the village Cross and not a grumpy house though. Moving on, over this lovely mossy wall I spied some crocuses and the ornamental quince in the second picture is already in flower, although the leaves appear to be a little sparse but looking great against the red brick wall. I don't think ours are out yet, I'll have to check next time I brave our garden. As a confirmed city dweller I loved this country style fencing - which I wish I could remember the name of, if you know please let me know by leaving a comment. I think Carol Klein tried this alongside the professionals in her garden on Gardeners World a few years ago. It's definitely functional and not something we have in town, sadly. It was about here, as I leaned into this garden to get a better picture of the hedge that MOH threatened to disown me. He didn't, but just look at that hedge - isn't it great? And wouldn't you have leant in for a picture? And with that, before I really was disowned we headed back to our cottage for lunch. I hope you've enjoyed this walk around this small Dorset village, we had a great time staying there.